A solid connection is a string connection. String connection is defined as "A string connection is a stone placement that connects itself to a string or unifies two or several strings as one string." Definition 1 has been used mostly at Sensei's Library iteself or by people learning the term solid connection from Sensei's Library. Otherwise RobertJasiek has not seen it used in this meaning. At the same time, definitions in literature were missing or weak. Readers of example comments in literature could easily overinterpret a careless, too short description as the term's definition. 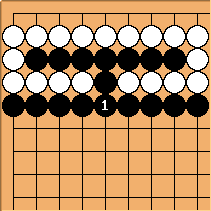 In Solid Connection page version 1 in 2001, Unkx80 provides an example with this comment: "[...] the [...] stones are physically connected and there is absolutely no way [the opponent] can separate the stones." "A solid connection physically connects stones." In Connection page version 12 defines solid connection as "stones are connected 'along the lines'". The versions 9 to 11 are not available, so the author cannot be identified. In Connection page version 29 defines solid connection as "two or more stones are connected if they belong to the same chain, i.e. when they can only be taken from the board together". The versions 22 to 28 are not available, so the author cannot be identified. "A solid connection connects two or more stones so that they belong to the same string." 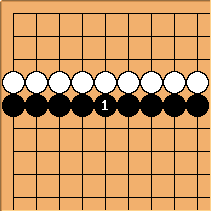 This definition of solid connection is seen in contrast to tactical connection ("Stones are connected if there is no viable way for an opponent to separate them. Although not part of the same chain, they can always connect to form one.") and strategic connection ("Stones are connected if they are part of the same group. Although they might still be separated, they currently function as a single unit for strategic purposes like attack, defence and living."). solid in solid connection can be confused with other usage of "solid". 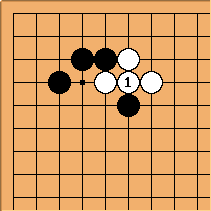 Definition 1 allows both bad moves like in Exa. 1.2 and good moves like in Exa. 1.3. In solid connection page version 18, the user 62.237.44.16 aka Bass defines: "A Solid Connection is a connecting technique that joins previously cuttable stones to each other so that there is no gap between them. Because all the stones now belong to the same chain, the stones connected this way can never be separated from each other again." "A solid connection forms a string by joining previously cuttable stones to each other. "A solid connection is a string connection joining previously cuttable stones to each other. According to definition 2, this is not a solid connection because it does not join previously cuttable stones. Definition 2's criterion "joins previously cuttable stones" tries to express solid connection as a move with good purpose: previously cuttable stones cuttable stones are joined so that then they cannot be cut. However, Exa. 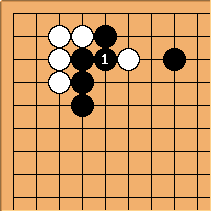 2.1 shows that the intention is not fulfilled; such a bad move is allowed under the definition. Some Sensei's Library users frustrated by weak definitions and their effect of allowed bad move examples have suggested "Definition XY must be interpreted by context of usage and / or examples." Comment: An ambiguous context guideline is not a definition but a non-definition, i.e. the failure to provide any definition. A solid connection is a string connection that is a thick cut protection, connects exactly two strings not in atari and then blocks opposing stones. This definition by RobertJasiek occurs in the book Joseki Volume 1 Fundamentals. "A thick cut protection connects a player's stones while making thick shape and protecting against an opposing cut." "A play (or stone) creates thick shape if it leaves behind little or no aji. The opponent cannot capture, cut or play painful forcing moves against it." This is not a solid connection because it does not protect against a previously possible opposing cut. This is not a solid connection, e.g., because it does not create thick shape. 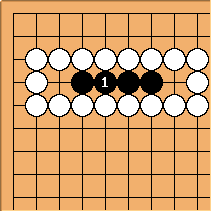 This is not a solid connection, e.g., because the opponent can capture the created string. This is not a solid connection, e.g., because a previous string was in atari. This is not a solid connection because it connects four instead of two strings. Such is excluded because overconcentrated moves are bad and do not conform to the idea that solid connections are locally good moves. This is not a solid connection because it connects three instead of two strings. It is a good move and that is reason why it should be a solid connection. It leaves the left white stone in bad shape and that inefficiency of shape is reason why it should be a solid connection. The definition's condition "connects exactly two strings" might be too strict. This is a solid connection. According to definition 4, this is not a solid connection because a string was in atari and because three instead of two strings are connected. It is an "escape from atari" and a "thick string connection" though, i.e., a string connection that creates thick shape. That, in contrast to Exa. 4.10, this Counter-exa. 4.11 is not also a solid connection shows the limits of definition 4. The criteria "connects exactly two strings" and "previously none of the strings was in atari" might be too strict in the general case. A solid connection is a string connection, makes thick shape and protects against an opposing cut. Makes thick shape implies these aspects: the opponent cannot capture the created string; leaves behind little or no aji in the created shape. The referred to opposing cut is a previously possible one. A solid connection protects against an opposing cut. This is often accompanied by the string connection criterion. Such a definition of solid connection is seen in some rough lists of go term definitions in literature or the web or supported by a few users here. This bad move example is a solid connection. 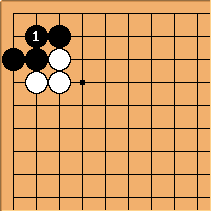 This good move example is a solid connection. This bad move example is a solid connection: it string-connects and protects against an opposing cut. The definition does not care that that cut would be bad. This is a counter-example because before there was no cut for the opponent. Rather then preventing an opposing cut, what is being prevented is a capture by the opponent. Therefore this is not a solid connection according to definition 5. If White moves first, then (probably) White cannot cut. 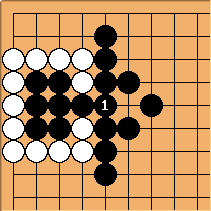 Therefore Black 1 does not protect against an opposing cut. So it is not a solid connection. 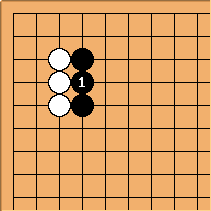 If connection / cut is understood in a more general form, then a white 2-cut (cut by 2 successive plays before Black starts to defend) is possible and in this sense Black 1 would be a solid connection. The definition allows both bad move examples and good move examples. Some counter-examples should be but are not allowed. This lets the definition appear too weak in its assessment of solid connection. The make thick shape criterion is missing while the "protects against an opposing cut" condition is shown as too strict, unless "cut" is understood in a generalized n-cut meaning. According to RobertJasiek's observation, the common usage in literature and among players not having learned their terminology from Sensei's Library is close to a hybrid between Definitions 4 and 5. A careful definition of that cannot be found yet. 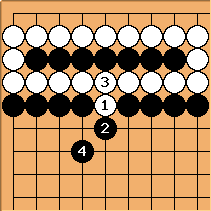 According to John Fairbairn, Japanese usage sees these types as solid connection: kadotsugi (angle-point connection), katatsugi (solid connection), gatchiritsugi (tight connection) and boutsugi (pole connection). A solid connection is a string connection, makes thick shape and protects against an opposing cut created after 1 or 2 successive plays. 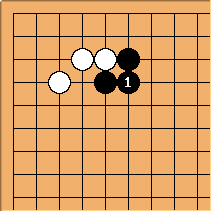 The opponent White could cut by 2 successive plays. This fulfils the cut condition of the definition. So we have a solid connection here. This is not a solid connection because it does not create thick shape. 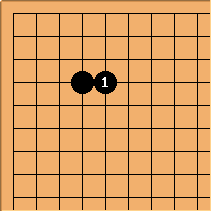 This is not a solid connection, e.g., because the opponent can capture the created string and therefore it is not thick shape. 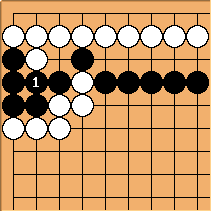 This is not a solid connection because the opponent threatens a capture but does not threaten a cut. 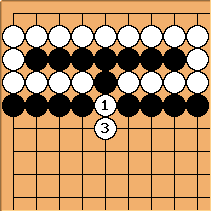 This is not a solid connection because the opponent does not threaten a cut. The definition works as desired: Bad moves are excluded, good moves are recognized, counter-examples work well.